Is an Oil Tank Heater Right for You? Some states are encouraging refiners to reduce oil heating sulfur content from 1,500 parts per million (ppm) to 15 ppm, making it among the most environmentally friendly fossil fuels on the market. Heating oil prices have declined sharply over the past ten years. Because it first has to be atomized to burn, heating oil can't be ignited by accidentally introducing it to flame. If you accidentally drop a match or cigarette into an oil tank, it won’t burn or explode. The flame will be extinguished. Some varieties of heating oil, such as ultra-low sulfur heating oil (ULSHO) and BioHeat, drop the emissions of heating oil to almost zero, making it even cleaner than natural gas. New improvements to fuel mixes and additives have reduced the occurrence of paraffin crystals in oil tanks, which helps to avoid the gelling problem that you may have heard about, which happens at lower temperatures. While the initial cash outlay is similar to the cost of other types of heating systems, your oil tank will require less maintenance due to its simple design. Heating oil is among the cheapest heating fuels available, so you’ll realize savings throughout the long life of the unit. How Does an Oil-Tank Heating System Work? To make an informed decision about an oil tank purchase and installation, it’s helpful to have a basic understanding of how it will heat your home. Your thermostat will dictate when your oil-tank system activates. Oil is pumped through a filter to an atomizer, which converts it into a mist. The mist is released into a combustion chamber, where it’s ignited in a controlled burn, releasing heat. What occurs next depends on the type of distribution system you have in your home. In warm-air based systems, the ignited oil heats the air, which flows into the vents that run throughout your home. With water-based systems, the water is heated and flows through pipes below the baseboards and radiators, or it’s converted to steam. All three are effective ways to raise the temperature of your home. Inside vs. Outside Oil Tank – Oil-tank heating systems come in both indoor and outdoor varieties. If you’re happy with the location of your current tank, you’ll likely replace it at the same location. If you want to free up some garage or basement space or plant a flowerbed, you may consider making a change. Outdoor tanks are vulnerable to the elements. Temperature fluctuations can cause condensation, which can promote bacterial microbe formation in your tank. The cold can also lead to gelling problems. The ground supports outdoor oil tanks, so their weight can cause them to shift over time, which puts stress on the unit. Another issue with outside oil tanks is the snow settling on the unit and lines, which can cause freezing or gelling. Indoor tanks are protected from the elements, which gives them several advantages. The heating oil remains around room temperature, which means that it won’t gel. The stable floor of your garage or basement keeps the tank from shifting. One of the only drawbacks to inside oil tanks is that they take up indoor space. Aboveground vs. 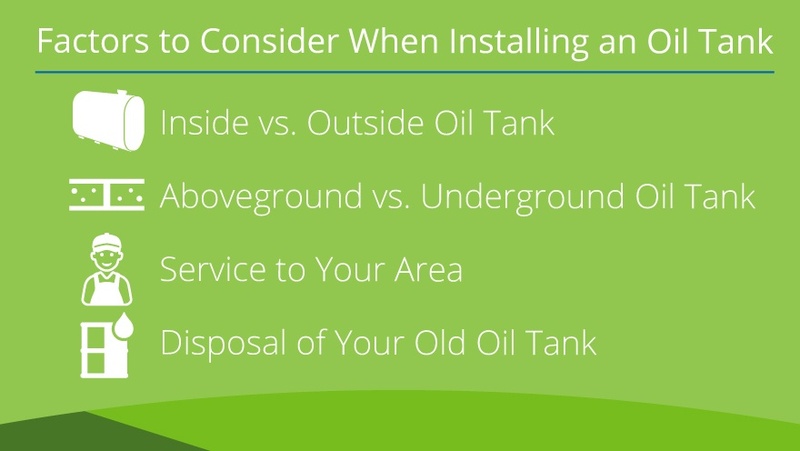 Underground Oil Tank – Inside oil tanks are above ground units, but if you’ve opted against an oil tank inside of your house, you’ll have to decide between aboveground and underground tanks. Aboveground tanks are easier to install and access for maintenance and heating oil deliveries. There aren’t any buried pipes or lines to worry about, so you can choose the size, shape and location of your tank. Aboveground units should be made of durable steel since they’re exposed to the elements. Oil tank installation regulations dictate materials and construction of oil tanks. The ground provides a degree of insulation for buried units and lines, but aboveground tanks are more prone to heating oil gelling. Underground oil tanks have the advantage of being mostly invisible. You don’t have to give up usable space in your house or your yard. The ground keeps them warmer as well, so gelling is not as much of an issue. There are some significant drawbacks, however. Underground tanks are difficult to inspect, so if there’s a leak or signs of corrosion, it may go undetected. Both the unit and the installation tend to be more expensive than aboveground units. Removal of underground oil tanks is also more expensive than their aboveground counterparts. Service to Your Area – If you live in the northeastern United States, there’s likely a heating oil delivery service close to you. Any reputable oil tank installer can provide you with the name of a company that can supply your residence. If you don’t have a heating oil service that delivers to your neighborhood, you may want to rethink your decision to purchase an oil tank. Most people don’t have the means to transport 275 gallons of diesel to fuel their tanks. Learn how Shipley can help! Disposal of Your Old Oil Tank – If you’re replacing an old oil tank with a new one, make certain your installer will remove your old tank for you. Some states charge a disposal fee for oil tank removal and many municipalities require a permit. Underground oil tanks usually cost more to remove than aboveground tanks due to the additional labor involved in excavating and lifting the tank from the ground. For most homeowners, installing a heating oil tank is not a do-it-yourself project. There is an oil tank installation code and oil tank installation regulations that govern everything from the manufacture, installation, servicing and removal of oil tanks. Unless you have experience installing oil tanks, this is a job best left to professionals. If you already planned to hire a licensed professional to install or replace your oil-tank heater, it’s helpful to know your installation options so you can make informed decisions about your purchase. In most cases, the new oil tank will go in the same location as the old tank. It makes of sense to go with this option if you don’t want to reroute your lines to a different location. If you’re replacing your tank because it’s coming to the end of its warranty and perhaps started to lose efficiency, the old location is probably fine. However, if your previous tank showed signs of stress, leaking or shifting, the surface may not have been suitable to support the weight of a full oil tank. If this is the case, you may need to support the unit with a concrete slab or select firmer ground. Another factor to consider when installing an oil tank is its proximity to the residence and trees. Falling snow or snow-laden branches can damage your oil tank. If you have a sloping roof, your tank should be placed at the gable end of the roof. In other words, the tank shouldn’t be located on the side of the house where the roof slopes downward, as that’s where snow and ice are likely to build and fall on the unit. If you don’t have any other option, build a structure with a roof over the unit. A covering of this sort can protect it from falling debris. Snow will settle on the roof instead of the tank, which helps prevent the problem of gelling, but it adds to the overall cost of installation. Installing an indoor tank is a viable option for many homes, and it helps you avoid the outdoor element considerations. If you have the space for an oil tank in your garage or basement, it may be worth the investment of rerouting your lines even if you’re replacing an outside tank. The first consideration for tank selection is whether it will be located indoor or outdoor. Oil tank manufacturers will specify whether or not their product is rated for outdoor usage. If you intend to bury your oil tank, you may have to contact the manufacturer or ask an experienced professional who’s familiar with the model about its suitability for below-ground use. Size is also an important consideration. The average tank size holds 275-gallons and will receive one delivery of oil per month during the coldest months of the year. There are smaller and larger tanks available, but if your tank is too large, unused oil can sit too long and can break down without the addition of preservatives. It’s unlikely that you can predict your exact usage, so we recommend selecting a tank that will slightly exceed your needs, as emergency deliveries for heating oil can come with a hefty surcharge. As long as your tank gauge is working and you monitor it periodically, you can avoid running out of heat at an inopportune time. If not, diesel fuel is essentially identical to heating oil and can be used as a substitute in an emergency. But always check with the manufacturer before putting diesel in your unit. A standard 275-gallon tank is adequate for most residences and comes in different shapes to accommodate your available space. There is also the cost of the heating oil, which can fluctuate with petroleum markets. Most distributors charge a fee for home delivery in addition to the price of the heating oil. Instead of filling an entire 275-gallon tank on their own, most homeowners tend to use a heating oil company for delivery service. You can check current heating oil prices in your area with Shipley Energy with multiple ways to buy and match your budget. All of the states where heating oil is widely used have adopted some form of oil tank installation regulations for environmental safety, personal safety, and consumer protection. The industry standard for the units and their installation, developed by Underwriters Laboratories (UL), vary for inside, outside, and underground tanks. The standards regulate the materials that go into the construction of the oil tank, the size of the tank, the type of pressure tests required for the tank, where the drainage valve should be located on a tank, guidelines for proper labeling, and a number of other safety and construction features. In addition to the Underwriters Laboratory standards, the National Fire Protection Association (NFPA) also has established an oil tank installation code, referred to as NFPA 31 – Standard for the Installation of Oil-Burning Equipment. The standardization of oil tank manufacturing and installation compels all professional installers to certify themselves in the nuances of the applicable codes. The list may seem intimidating to the average consumer, but a licensed oil-tank installer will be well versed in the regulations and codes and can guide you through the selection process. If you’ve ever done an internet search for the pros and cons of oil-tank heaters, you’ll come across multiple references to “waxing” and “gelling” at the top of the con lists. Waxing refers to the formation of paraffin crystals that form from the hydrocarbon chains in diesel and heating oil when the temperature of the petroleum product drops. 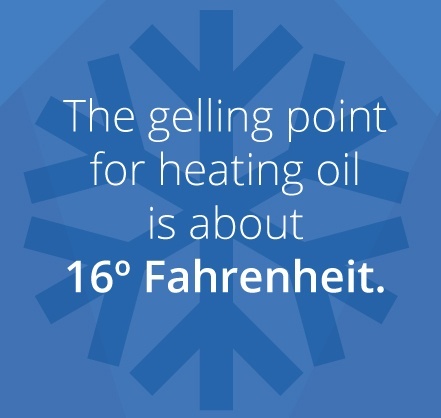 The gelling point for heating oil is about 16 degrees Fahrenheit, which is a temperature that is frequently seen during the cold northeastern winters. When this temperature is reached, the oil can develop into a sludge that can coat your lines, clog the atomizing nozzle, and reduce your unit’s overall efficiency. Fortunately, there are a number of measures you can take to prevent gelling and waxing, and some of them can be done at the time of installation. For instance, the wider the fuel lines, the less chance for them to become clogged due to gelling. Insulating or burying your lines can help prevent the temperatures inside the line from reaching the gel point. Many installers offer housing or sheds that keep snow and ice from forming on the surface and freezing your oil tank. 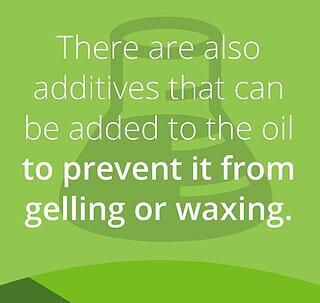 There are also additives that can be added to the oil to prevent it from gelling or waxing. Permitting and inspections are usually handled at the municipal and county level, and the fees can vary from one jurisdiction to the next. If you’re installing a heating oil tank, it’s to your benefit to research the process for applying for a permit in your town before contracting an installer. It’s not unusual for a city to take five to ten business days or longer to issue a permit. Invariably, a mandatory inspection follows the installation, and while some municipalities include the inspection fee in the price of the permit, others charge an additional fee for the required service. Local permits and inspections are usually required for all types of heating and air conditioning systems, so it's not an expense or inconvenience that’s exclusive to oil tanks. Oil Seepage – If you see heating oil outside the tank, there is probably a breach. Heating oil will not ignite without being atomized, but it does have an odor and will seep into the ground. Water Inside the Tank – As temperatures fluctuate, condensation leads to water accumulation inside of the tank. This can cause microbes and rust. Oil and water don’t mix, so you can often see the water inside the tank. This is also a sign that moist air is getting into the tank via a breach. Plumbing Connections – An oil tank is only as good as its plumbing. Breaches most often occur near joints and seams. Fortunately, plumbing leaks usually don’t require a full system replacement. If your lines are narrower than 2” in diameter, you may want to consider upgrading regardless of whether or not you spot a leak. Check Welded Points – Oil tank welded seams can weaken over time. Have them checked by a professional when your tank is serviced. Physical Damage – No matter how careful you are with your tank, they sometimes can become damaged or dented. Periodically examine the exterior of the tank to be certain that there are no signs of damage from weather, lawn maintenance, or collisions. Mechanical Breakdowns – Your oil tank is a relatively simple piece of equipment, but the thermostat, pump, and the other working parts are susceptible to breakdowns and wear and tear. If your oil-tank heating system isn’t performing well, it may only require a new thermostat, pump, or other part. Routine maintenance should help you avoid being caught by surprise. If you’re considering purchasing or replacing an oil tank to heat your home, you owe it to yourself to learn the facts about different heating options. Oil heating is efficient and cost-effective. And thanks to new refining processes, it's also environmentally friendly. Make sure it’s a good fit for your home. Looking for an oil tank installer in your area? Shipley Energy offers a wide range of high-quality fuel storage tanks to fit your needs. Learn more about what we can do to help you, and contact us today to discuss the best option for your home.